With a wide array of tile styles, texture and colour to choose from, now more than ever you can create a bathroom renovation that not only has charm but reflects your personal taste. Whilst it’s easy to go the simple route with plain wall and floor choices for your bathroom renovation you may miss the opportunity to decorate and create something with visual interest. It doesn’t have to be outrageous, but injecting personality through contrast or colour can make all the difference. A good place to start is to review the most recent tile trends for bathroom walls and floors. 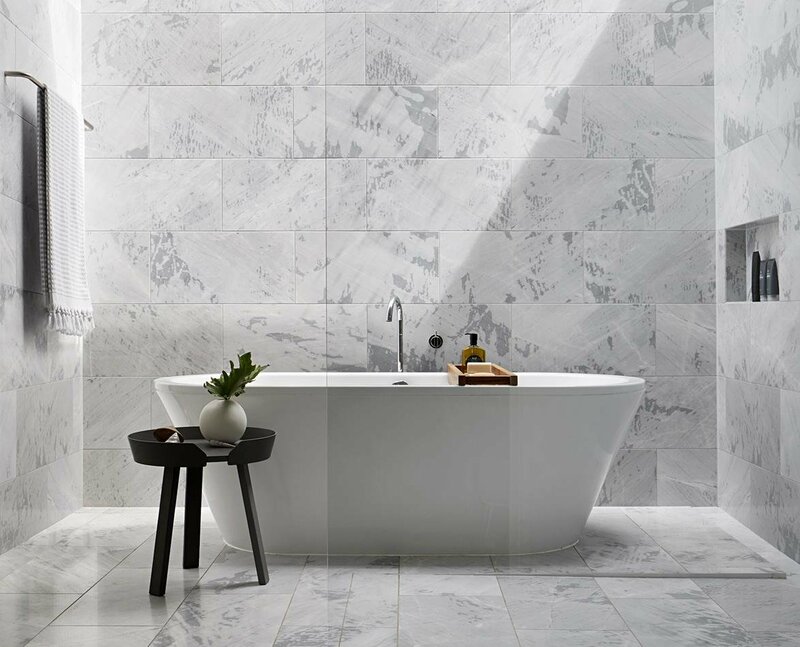 In this month’s B&C Journal we’ll give you a tour of the latest in tile trends to help you find the right choice for your upcoming bathroom renovation. We hope this article will help choosing tiles for your next bathroom renovation easier. Always popular because they are impactful and help create an illusion of space are large format tiles. Large format tiles in your bathroom renovation will allow for a more seamless finish, and with minimal grout lines, have the added benefit less cleaning and maintenance. Today’s tiles come in a myriad of different shapes making it easy to add a dash of interest and personality to your bathroom design. The two shapes which are currently on trend are Scallop and Penny Rounds. 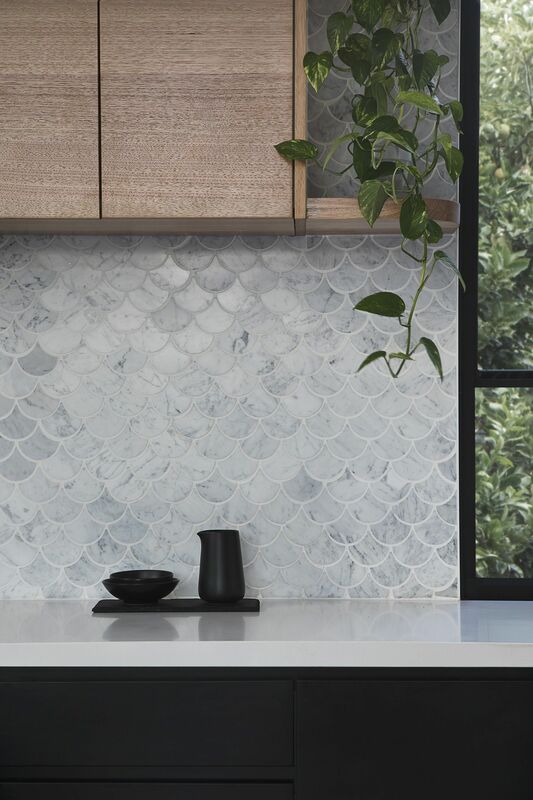 Scallop tiles also known as ‘fish scales’ tie in beautifully with bathrooms and we suggest, in a bathroom renovation, using them in tasteful muted tones to ensure your overall look doesn’t date. Penny rounds are another popular shape for bathroom renovations. They are versatile and work well with both modern and traditional schemes. For a more contemporary look experiment with contrasting grout colour. Like many other tiles, penny rounds also come in metallic finishes for added glamour. If your inspired by European bathrooms and looking to add an exotic element to your bathroom design, perhaps pattern tiles maybe the right choice for you. Encaustic tiles are a perfect example of how you can add pattern and colour to an otherwise sparse space. They are filled with character, beautiful and are experiencing a resurgence in popularity. Marble suits a range of interior styles, from classic to ultra-modern. Take a contemporary approach, by using more large format (600 X600) marble tiles as a base, and paring it with on-trend black tapware and accessories for your bathroom renovation. 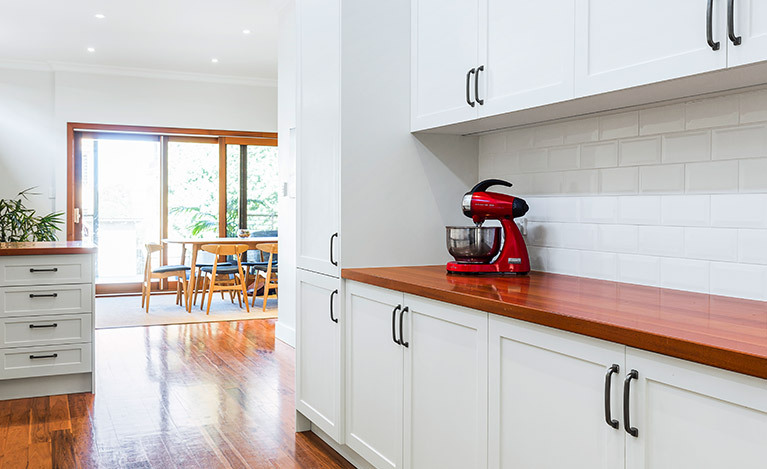 For a more traditional look, lay smaller marble tiles for eg (300mm x 75mm) in a herringbone pattern and combine with more traditional pieces like a claw bath or shaker style cabinetry. To create a more subtle look, consider teaming large-format white tiles on your walls and dedicating marble tiles to the floor – this is also a more economical approach. With plenty of marble tile shapes on the market, from hexagonal, round to subway style - from high end to cost effective marble look tiles - the choice is yours. Technology has allowed the for the mimicking of natural stone and timber into a durable porcelain tile. Timber, marble, stone, terarazzo and concrete to name a few are now all available in a porcelain conterpart - often offering the look at a more economical price and greater durability factor. Design Tip: Opting for a Matt finish - Today’s bathroom renovators are opting for the more timeless appeal of matt finish tiles. Matte tiles are durable and are less prone to smudging or showing of water marks unlike polished tiles. They are ideal for high traffic areas like bathrooms as their low sheen apprearance makes them easy to clean and maintain. Over the last few seasons Herringbone tiles have become a very popular, particularly in traditional style bathrooms. Provided you select the appropriate size a herringbone pattern can create the perfect canvas for both walls and flooring in a bathroom. If your looking to add a bit of luxe or sophistication to your bathroom renovation, herringbone tiles are definitely a great option. Design Tip: Make herringbone a feature in your bathroom by using herringbone pattern on a single wall for eg in your shower or behind a vanity. Wet area panelling offers a versatile and durable alternative to conventional tiles, and is perfect for bathrooms. Seen often in more ‘farmhouse’ traditional style bathroom renovations but versatile enough to complement a more modern look. By using coloured grouting to provide contrast you can create a very unique, playful an interesting aesthetic to your bathroom design. Bright tones like pink, blue and green contrast well against lighter tiles whilst gold inlay or more metallic grout colours contrast well with darker tiles. By highlighting with coloured grout you can also accentuate areas of your room for eg highlighting length or even making a room appear more spacious. Still unsure about how to renovate your bathroom? Leave it to the experts at Balnei & Colina and book a bathroom design consultation today on 1300 450 320. Or simply visit us at balneiandcolina.com.au, drop us an email info@balneiandcolina.com.au or connect with us via Facebook or Instagram to stay up to date with the latest in bathroom design trends.